Crafted from polypropylene for durability and softness, this eye-catching Wakawrug from Copper Grove will bring contemporary style to your decor. The head-turning, machine-woven rug features a geometric pattern, rendered in brown, black, red, gold, beige and blue colors. This rectangular rug contains latex for added durability, making it a classic and practical choice for your home. Dimensions 114.17 In. X 78.74 In. X 0.43 In. Pretty satisfied with this product. In person, the colors are a combination of deep red, ivory, and brown. Feels pretty soft underfoot and even better with a rug pad underneath. Like a previous reviewer, I needed a more contemporary design to update the decor in our great room and this rug is perfect! The colors are represented accurately in the photograph, with nice deeper (NOT "bright") tones of brown, deep rusts and gold, maroon and beige, as well as slight neutral green and muted bluish accents. For that reason, it would be a versatile addition to a room that uses these colors as accents, with lighter walls or flooring as a nice contrast. I would suggest that this rug be used in areas that are not necessarily high traffic, because it is not as heavyweight as might be needed in such a location. (We are using it under a coffee table, for instance.) It is a nice medium-weight, however, and will meet our needs wonderfully. REALLY happy with this purchase and was grateful for the other reviews, which were very helpful at representing the color, quality and versatility of this item. That was the key in making my selection! I recently moved in an older home with all refinished hardwood floors. My living room flows into a mid size space then into the dining area. I bought the 10 x 7 first for the living room and loved it so much I bought the 5x7 for the mid size area then the smaller one 5x4 for the area near the door to the dining room. They all flow together but different sizes and the colors are fabulous! I've gotten so many compliments and another thing is I have 2 small dogs so the dirt won't show up because of the color blend. Very soft on the feet ..excellent purchase for the price. Very happy with these rugs! Great carpet for the cost ! I purchased the Copper Grove WakawBlocks and Rings Brown/Black Area Rug a while ago and it it still like new even after lots of visitors, grandkids and many dogs later. It is very easy to take care of and really shows no wear after all this time. I ordered multiple sizes for the rest of my living area once the first one arrived. I get lots of compliments on this rug. Great quality...love the colors! I am very pleased with this rug! When it first arrived I thought I would be disappointed because it was not as thick and heavy as I expected it to be, however, it has turned out to be better than expected. It is super easy to clean and feels nice and soft. The color and pattern is great. I wanted an abstract, contemporary design, but wanted an element to soften the look. The circles do just that. There are enough colors in this rug, it would work in a variety of color schemes. I also love the size of this rug. A little bigger than the stand 6x9. It works great under my 86", mahogany, benchwright **** table. It completes the look. Very happy with this rug. I was looking for a way to update the decor in my house from traditional to more modern. I purchased this contemporary rug because it matched my existing color pallet, but the geometric design was more contemporary. I originally purchased it for the dining room, but laid in the family room to flatten out the corners. I liked it so much in the family room, that I am buying another rug for the dining room! It is a very pretty rug. I wish the supplier had a round version of it. I got this rug to go in my living room over my new hardwood floors. It arrived quickly, the quality is great and the rug looks fantastic! The colors are a little bit more muted than they appeared in the picture, and there is a little bit of blue interspersed throughout, which is perfect. I wasn't in love with the rug based on the pictures, but ordered it because of good reviews and it was the only one my husband and I could agree on, and I'm very pleased with the decision. Shipping was fast and I was very happy when it was unrolled. Colors were brighter and crisper than the picture shows and it blended perfectly with my decor. It is in a very low traffic area so should wear well. It has only been a day and already it has flattened out and seems like it should have always been here. Very happy with this purchase and will be ordering more rugs from this site. 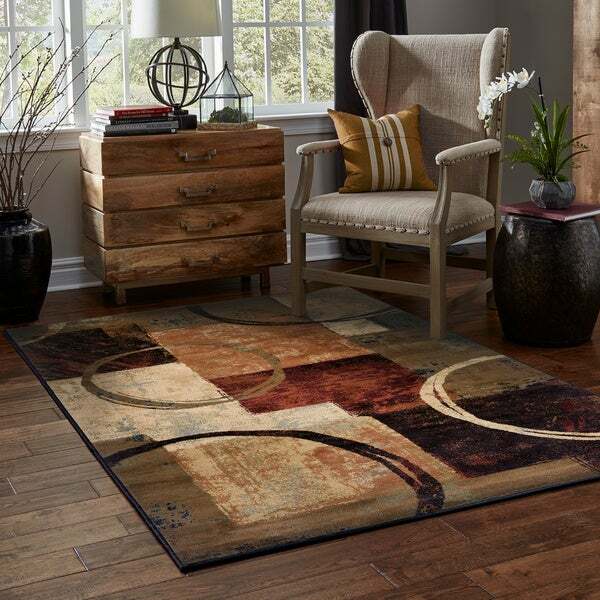 I have bought 3 rugs form Overstock.com now. While I have loved all 3, this one is the best quality of the 3. Vibrant colors, very soft and plush, and when I unrolled it, there was absolutely no creasing or curling. Usually I have to let the rug relax and place heavy books on the edges. Not so with this one. It laid beautifully from the minute I unrolled it. I bought a thick, quality pad to go under it, and I love everything about the rug. Exactly what I was hoping for. Perfect condition, very soft. Very first online order ever and couldn't be happier. Nice rug but a little over priced. Beautiful rug once it was laid out. The rug ends tended to stay curled for awhile. Had to put some hand weights to keep them down. Ends finally settled down and overall it looks very good. I never write reviews but ALWAYS read them prior to purchasing products online. This rug fits perfectly in the living room of our new house. The colors are great, the rug is plush under our feet and so far stands up well to our young kids and dog. I LOVE the fact that I don't see dog hair on the rug like I did on our old one. My husband has left decorating our new house up to me because he doesn't have much of an opinion and even he thinks this was a fabulous purchase. Not at all what I expected I really thought that the rug was going to be thicker and it’s made cheap. It’s too bad it’s not like what the other reviews stated. Looks even better in person...Beautiful...Great Buy!! I lo e this rug very nice in our living room. The colors are just the perfect fit. If I had to order again it would be similar to the one I ordered.. I had purchased this rug for my son’s birthday. The rug arrived on time and it was a great success. He loved he rug. It really gives his living room a great look. The rug is strudy and beautiful. Thank you for making my birthday gift to him a successful one. Worth the price! This rug is easy to match to anybody decor because there are several neutral tones in this design. I used it for my front foyer since the pile is low and it covered my hardwood floor nicely. Good buy! I purchased this rug for my office that I was renovating and it worked out well. The rug is gorgeous and the colors are beautiful. The price was great and we have received many compliments. We loved this rug so much we ordered another one. "Question for seller only - I have this rug in my living room. Is that a possibility that you cam make a 10" runner for me from the same design?" Unfortunately we don’t do custom rugs. The only size runner for this rug is 1 feet 10 inches x 7 feet 8 inches. "latex backing .... non slip ?" This is approximately 50 pounds. "What are the colors? In specifications it says blue/Black and in the explanations section it is red,black,brown,green, blue"
The main colors of this rug are brown and black as the Product name states. However, the rug many colors including red, a pale blue/grey, sage green and gold. "Is there any orange in this rug? I am looking for a rug with browns and orange. would also like a matching runner." More of a rust color than orange. "Does the sides or corners roll up or does it lay flat?" "Does this rug have the latex protection on the bottom of it so the rug does not scratch the hardwood floors?" Yes, it does contain latex. We recommend the use of a non-skid pad to keep the rug in place on smooth surfaces.